These two episodes composing the OAV series, released in Japan around December 2005, are here to more or less fill in gaps of chapters from the manga that didn't make it in the first TV series. This is seriously the most I can say without giving away spoilers. Most of the time when an OAV is made, it's made for one of two different reasons. One reason is to expand upon the TV series (or video game or manga) of the original source material, or to focus on a certain character some more, or as a "what-if" story. The second, and unfortunately more common reason, is to pry the last little bit of money off of fans of a certain series. The School Rumble OAV, sadly, follows the latter approach. Instead of expanding upon the TV series or focusing on characters virtually ignored in the first TV series (such as Akira) as well as stop introducing new ones we instead get short, almost unrelated skits that take place between certain points of the TV series (though in all fairness, some of these new characters, such as Yoshidayama and a spirit girl that only Yakumo can see, are fairly important characters that flow into the second TV season). As anyone who's ever read the manga knows, School Rumble is divided into two different chapter types; sharp chapters (main story), and flat chapters (side-stories and Yakumo stories). Instead of focusing entirely on the flat chapters not used in the TV series, Studio Comet decided to mishmash material from both types together, a way they were never supposed to be played out. The end result feels disjointed, and except for a prehistoric take on School Rumble in the second episode and a take on a scene late into the first season involving Harima, all these scenes were already shown in the manga, in a more coherent fashion. This might be good and all for School Rumble fans who want to see any and everything from the manga in animated form, but I wasn't as impressed. The reason why I wasn't so impressed mainly has to do with the fact that there's no flow whatsoever between the OAV segments. One of the things about the School Rumble TV series was that, much like Azumanga Daioh and Sgt. Frog, the episodes were divided into multiple parts that flow from one part to the next. Even the flat chapters in the manga correspond to the sharp chapters of that volume or of previous volumes, despite being pushed to the very end of every volume. But in the School Rumble OAV, it's more or less jumping from one part of the manga to another every six or seven minutes, which won't help you much unless you've seen the first season in its entirety. Not like Studio Comet even bothered to make it look like an OAV. It has the same level of art and animation (read: passable at best), same soundtrack, same seiyuu, and even the same OP theme. About the only thing new is the first episode's ending theme and animation, and the song itself is an insert song remixed from the first TV series. The second episode, which uses the TV series' ED theme, features a twist on its animation by replacing Harima with the five main girls (Tenma, Yakumo, Mikoto, Eri, and Akira), and the girls with guys. I'll admit it was cute, but I wouldn't have minded a brand new song instead. Also, there's a frustrating waste of potential, the worst involving minor characters pervert Imadori Kyousoke and Mexican lucha wrestler Lala Gonzales in the 2nd episode. The plot is pretty simple; Kyousoke visits Lala and Karen at their place of work. Instead of asking for a meal, Kyousoke asks Lala to smile for him, claiming that "a smile is free". Lala gets annoyed by this, and beats up Kyousoke there and now on the restaurant floor, with the manager begging her to stop hitting him. After wards, she meets up with a cat who looks quite hungry, and feeds her one of the burgers from her McDonald's-esque restaurant of work. And here, for the first time in the series, we see Lala as more than a violent, loud Mexican wrestler, and see a softer side of her. Of course, she reverts back to her old Kyousuke-hating self the next day, where she pounds him even harder than yesterday when he again asks her for a smile. Although this scene flows into a scene in season two, I found it to be unnecessary and mean-spirited, and it just further proves that Kyousoke and Lala are far and beyond the most shallow characters in the series. The other segments fare a little better, the most important of which is a blackout scene involving Harima and a certain female character (read: not Tenma).Other segments s include Tenma trying to sit next to Ooji on the day the class change their seats (a scene from the way beginning of the manga; makes you wonder why they took so long to animate it), the aftermath of a romantic misunderstanding involving Eri, and Yoshidayama attempting to get the attention of Harima. 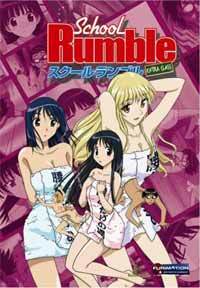 Though honestly, unless you can't get enough of School Rumble, head straight into the second TV series instead. It follows up on the stories from the first TV season in a much better fashion. Recommended Audience: Same content as the TV series; some comedic slapstick, suggestive themes (Kyousuke's fondness for girls with "D"-cup sizes), and some rough language.